Swift Transportation (SWFT) stock is falling this afternoon after rival trucking company Werner (WERN) issued disappointing current-quarter earnings guidance. NEW YORK (TheStreet) — Shares of Swift Transportation (SWFT) are down 6.51% to $15.80 in early-afternoon trading on Tuesday after rival trucking company Werner Enterprises (WERN) issued a second-quarter earnings forecastwell below analysts’ estimates. Werner expects current-quarter earnings to range between 21 cents and 25 cents per share, while analysts surveyed by Thomson Reuters are looking for earnings of 40 cents per share. The company blamed weak freight demand and higher driver pay for the lowered outlook. 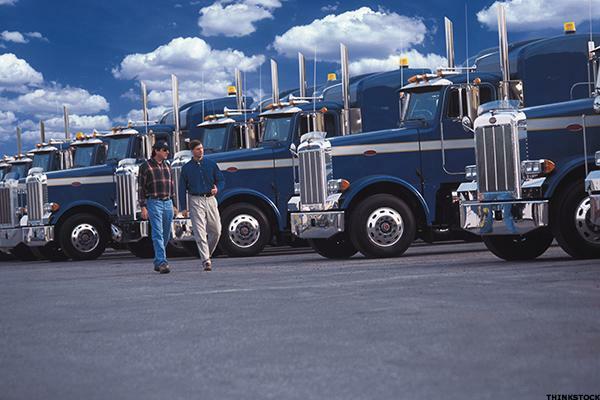 Freight is being negatively impacted by a slowing U.S. economy. The economy is forecast to expand 1.9% this year, according to Bloomberg, down from 2.4% growth during the previous two years. The markets may be unpredictable, but Jim Cramer can show you how to navigate it like a pro. Follow his blue-chip portfolio of stocks at Action Alerts PLUS. Join today and try it for 14 days—FREE! Separately, TheStreet Ratings team rates the stock as a “hold” with a ratings score of C+. Swift Transportation’s strengths such as its good cash flow from operations and notable return on equity are countered by weaknesses including unimpressive growth in net income, poor profit margins and a generally disappointing performance in the stock itself.